A: Why are you working with your cardigan on? Don't you feel hot? B: No. I have a summer-cold. B: It means catching a cold in summer. Is it Japanese-English? A: I think so. Well, how did you catch it in this hot summer? B: I slept with the air-conditioner on all night. 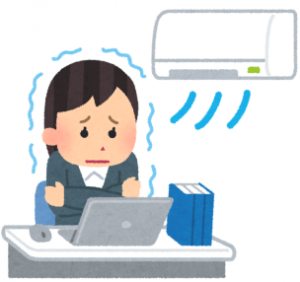 くれぐれも熱中症にはご注意下さい。"Please don't get a heat-stroke!"